Back in the 1960s, research representatives from various Swiss hospitality associations gathered to sign a document declaring dimensional standardization for all movable inserts such as pans, trays, wire racks, and other kitchen utensils and equipment. At this meeting the basic size of 530 x 325 mm, already in use with American standard steamable pans, was accepted. Gastronomical-Normal, or "Gastro-norm" was the name given to the newly developed standard. Though originally only intended for use in Switzerland, manufacturers from across Europe began adopting the standard not long after its development. This can likely be attributed to the logic and rationalization the system brought to kitchen production. Gastro-norm standards reduce storage, transport, and handling to a common denominator, all while making purchasing, equipment compatibility and kitchen use simpler and more efficient. 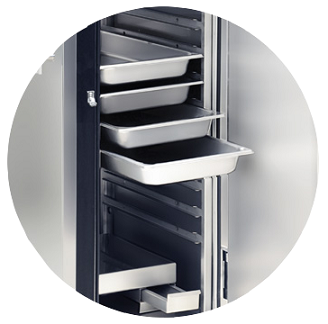 Since the same standard trays and pans are used everywhere, and the same containers can be transferred easily from one appliance to another. The standard makes for effective planning of working procedures from delivery, storage, production to service. Most gastro-norm containers can be made out of a variety of materials, most often stainless steel since it provides good heat retention for hot foods. Stainless steel is also strong, capable of withstanding a wide range of temperatures and has a polished look. Polycarbonate or polypropylene materials are also popular for cold food storage and display. Lid and cover options are typically available and often come with notches for utensil handles. Almost all European equipment is built specifically around GN sizing. Since the United States is a non-metric nation, equipment manufactured in America is not always made with GN standards in mind. At FWE we know how important the flexibility of gastro-norm is to kitchen operations across Europe. That's why, when we developed many of our models, we made sure that our units were built to accommodate GN sizing. 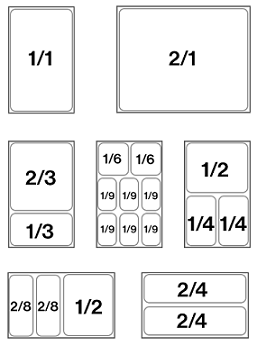 The fractional sizing is one of the main factors that makes GN containers interchangeable. For example, if your operation has a heated serving well with a GN 1/1 capacity, two GN 1/2 containers can typically be interchanged. Dozens of FWE's models accommodate a wide variety of gastro-norm sizing. If you are interested in speaking to a sales representative about models that can accommodate gastro-norm sizing or other products that FWE offers, please contact sales@fwe.com.